There is a common misconception about the ability of these foams to prevent the spread of fire through openings, particularly the repair of penetrations by service pipes and cables. 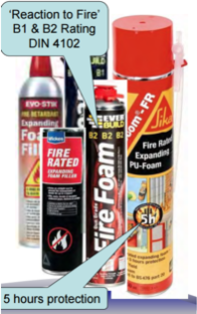 Fire foams are usually tinted pink to distinguish them from other non-fire rated foams, but they’re all different and have varying functions and properties - make sure the right one has been used for the application. Normally expelled from pressurised cans as a sticky liquid, which quickly expands to around 40 times its original volume to form rigid foam, PU foam is designed to fill small linear gaps or service penetrations. These foams are often claim to be ‘Fire Rated up to 4 hours’ citing a Class 0, Class B1 or similar performance, but these classes are for ‘reaction to fire’. They test the ignitability, surface spread of flame and heat release characteristics of the material, NOT THE FIRE RESISTANCE. The relevant tests for fire resistance are BS476: Parts 20, 21 or 22 and BS EN 1366-4 (or equivalent). Without clear manufacturer's guidance, they shouldn’t be used to fill large voids or openings as the foam’s fire-stopping properties may only be effective and tested in narrow voids or gaps. As a general guide these foam materials should be restricted to making good linear gaps and minor penetrations of not more than 15mm in depth. So when accepting the use of PU foam always ask the question – where is the test proof for these specific circumstances? And when holes around penetrations are located during inspections perhaps our reports should be saying something like – ‘There are holes around the duct at floor level. The holes should be filled with a suitable task specific non-combustible material, properly installed in compliance with the manufacturer’s instructions, to reinstate the partition to 30 minutes fire resisting standard. (The use of fire resistant PU foams should be restricted to linear gaps of not more than 15mm in depth)’. A trading estate landlord from Keynsham has been ordered to pay almost £15,500 for breaching multiple regulations, including fire safety. Allan Dykes pleaded guilty to five offences under the Building Regulations Act 2010, for which he was fined £13,000 by North Avon Magistrates' Court on August 26. He must also pay a victim surcharge of £120 and £2,348 in costs to South Gloucestershire Council in relation to the violations at the Bridge Road trading estate in the Kingswood area of Bristol. The council was alerted to the case by Avon Fire and Rescue Service (FRS) after a visit they made to the site to carry out a routine fire safety audit last February. At that time, they alerted council housing officers to evidence of people sleeping at one of the units, which is illegal. During several months of investigation, council officers worked in collaboration with Avon FRS and uncovered evidence that confirmed breaches of building regulations. Mr Dykes was later charged with five offences under the Building Regulations Act 2010. The offences relate to his not making reasonable provision to ensure adequate fire precautions were in place, including a lack of fire alarm and emergency lighting. He had also failed to adequately subdivide the walls in the industrial unit, which is a necessary precaution to help prevent a fire spreading to different rooms.